New York’s Constitution mandates that every 20 years New Yorkers be asked via a statewide ballot referendum whether they want to call a state constitutional convention. The next such referendum is on the ballot on November 7. If passed, the agenda for the constitutional convention that then occurs should include enhancing social welfare rights, including healthy public schools. The state constitutional convention held in New York in 1938 passed amendments mandating healthy work conditions for government employees, including healthy work hours. These amendments were added at a time when the conditions in public schools were very different. For example, the one-room schoolhouse remained common, dedicated public bus transportation to schools was just emerging, and forcing children to attend school before dawn was exceptional. If New York’s Constitution guarantees healthy work conditions for government employees, it should do the same for children attending public schools, who have even less choice over the place and hours of their work. Analogous to this bill of rights for government employees (“labor”), I recommend one for public-school students: “The state shall not compel students to sacrifice fundamental biological needs to attend public school.” This would include forced attendance at school prior to dawn and at times that make it impossible to get appropriate sleep. Note that in New York’s Constitution the term “common schools” refers to what we nowadays call public schools. Although this clause may appear vague and unenforceable to the casual reader, New York’s top court has interpreted it to mean that the Constitution guarantees every New York student, including disabled, delinquent, neglected, and dependent children, a “sound basic education” through high school. As applied to school start times, the proposed change to the education clause could be interpreted to entail a due process requirement when a public-school district mandates pre-dawn start times; for example, that a school district couldn’t arbitrarily schedule a poor child to take a public-school bus at 5:55 a.m. (before dawn) to attend a high school starting at 7:17 a.m. (also before dawn during winter months) without providing a reasoned, public explanation for its decision that explicitly considers children’s health and safety. Manageable court remedies for a school district with persistent unhealthy bus pickup or school start times could include mandating a healthy time or, less onerously, that the district offer the harmed students a voucher based on the district’s current average student cost. The voucher could then be used to allow the student to get a sound healthy education at another school. It’s arguable that New York’s clause, “No person shall be deprived of life, liberty or property without due process of law” already includes a right to sleep and health more generally. For example, on February 28, 2016, India’s Supreme Court ruled that “sleep is a fundamental human right” based on the clause in its constitution protecting the “right to life.” But given the history and wording of New York’s Constitution, such a court interpretation in the context of public schools is unlikely. New York also has a clause mandating that its “state board of social welfare shall make inspections… as to matters directly affecting the health, safety, treatment and training of [reformatory institutions’] inmates.” But public school children are clearly exempt from this requirement. Other social welfare clauses likely to be proposed at a New York State constitutional convention would be a guarantee of affordable basic healthcare coverage for all; affordable, debt-free tuition at public institutions of higher education; and a clean and healthy environment, including water and air. Redefining the definition of “needy” in the “aid, care and support of the needy” clause would also be likely. Consequently, it could be smart politics for the social welfare groups backing such proposals to form an alliance prior to the Nov. 7 referendum. 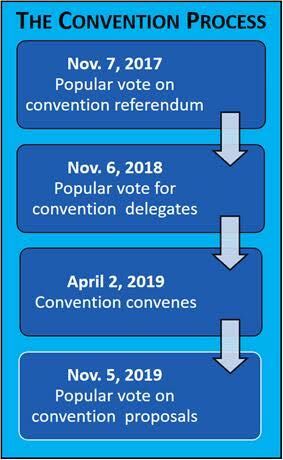 The constitutional convention process grants the public three votes (see graphic): 1) whether to call a convention, 2) who to elect to a convention, and 3) whether to approve any of the convention’s proposals. The purpose of the mandatory referendum provision is to provide a mechanism to bypass the Legislature when the Legislature would otherwise have veto power over constitutional amendments involving its own power and the special interests to which it is beholden. In other states, the constitutional initiative serves a similar function, albeit in a less deliberative and democratic way. Since the institution of a constitutional convention is a check on the Legislature, its natural enemies include the Legislature and any powerful special interest group that has a successful track record of influencing the Legislature. Coalition partners of these groups, who fear opposing their most powerful allies, are also its natural enemies, which may entail either taking a neutral position or actively opposing a measure that, absent the imperatives of coalition politics, they would support. Alas, many of these coalition partners are social welfare groups. 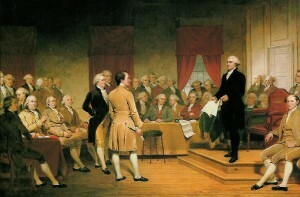 A primary argument that state constitutional convention opponents make is that a convention cannot be controlled by the Legislature and is thus a “Pandora’s Box.” But that is its prime virtue because if a Legislature could limit its agenda it would defeat the purpose of calling a state constitutional convention in the first place. The more relevant question is whether the people can be trusted to vote in their own self-interest. For thousands of years, the enemies of democracy argued that the people were incapable of making reasoned judgments about their own self-interest. They have a point, but in the long run actions premised on the people’s incapacity for democracy—including their incapacity to override a legislature’s veto power over constitutional amendment—have proven far more harmful. The health of our children should not be subject to the special interest politics that too often dominate American public education and intimidate parents whose children are held hostage. If Big Education views the cost of healthy public schools as a zero-sum game that comes out of its members’ paychecks, then it should be bypassed. In New York, the only available bypass mechanism is the state constitutional convention. If government workers have a right to healthy work conditions, so do children—even more so because they are children and have no say in the matter. American Academy of Pediatrics. Recommends that middle and high schools start no earlier than 8:30 a.m. for the sake of sleep, health, and learning, Aug. 25, 2014. American Medical Association. Encourages middle and high schools to start no earlier than 8:30 a.m. for adolescent wellness, June 14, 2016. American Sleep Association. Middle school and high school should not start before 08:00. A time closer to 09:00 or later would be preferable, Feb. 7, 2016. Centers for Disease Control and Prevention (CDC). Recommends that middle and high schools push back start times to 8:30 a.m. or later, Aug. 6, 2015. Education Commission of the States. Later School Start Times in Adolescence: Time for Change, May 2014. U.S. Department of Transportation’s National Highway Traffic Safety Administration. Asleep At The Wheel, March 2017. The RAND Corporation, Yale School of Medicine’s Department of Pediatrics, Robert Wood Johnson Foundation, and Start School Later, Adolescent Sleep, Health, and School Start Times National Conference, April 27-28, 2017, Washington, DC. Start School Later. An information clearinghouse on the science and public policy of healthy (post-dawn) K12 school hours.